Yes, I have a blog on the internet; and I’ve learned a few things about attaching links to text and photos. For this post, I even learned how to take a screen shot of a web page. Needless to say, my skills are extremely limited and I feel like I am nearly technologically illiterate. Therefore, I’m not comfortable teaching computer anything to my children. I’m grateful there are now computer courses for younger children available from Phyllis Wheeler, the Computer Lady at Motherboard Books. My Schoolhouse Review Crew mates and I recently had the opportunity to review two products from Motherboard Books: Logo Adventures – a full-year, homeschool computer science curriculum using MicroWorlds Logo language developed at MIT; and the concise, short-term project e-book, Let’s Make a Web Page. Logo Adventures is designed as a weekly lesson for 8 – 12 year olds, teaching students to read and write code, think logically, and strengthen their reasoning skills; as Ms. Wheeler walks them through the basic steps of starting to program while laying the foundation for understanding what it means to program. Logo Adventures Curriculum is a self-study book and answer key, plus MicroWorlds EX software for $129.99. You can check out the Logo Adventures website for a sample chapter, and a Gallery page of student work. I’m interested in reading the Crew Reviews for this one, because I didn’t have personal access to it. 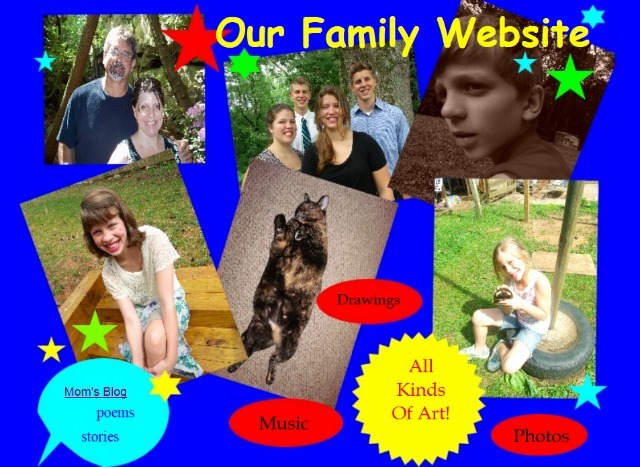 A couple of my children used the 60-page tutorial e-book, Let’s Make a Web Page. It is also written for children 8 – 12 years of age, but was easily adaptable for someone older, me. 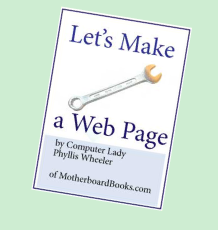 Using free trial software – CoffeeCup Visual Site Designer, this e-book will show you or your child how to make a Web page. It’s just $19.95, and it includes an Introduction for Parents, 10 step-by-step lessons — from download, set up, add text and photos, to sound, links, and post your work; with an Appendix: How to Upload to the Internet. Let’s Make a Web Page is easy to read and my kids found the instructions simple to understand and follow. One of the first things Ms. Wheeler does is coach the student through an interview process to determine who and what their web page will be about. Neither of my children had any prior experience building a web page. They talked to me, and I explained the types of things I wanted our web page to contain; while leaving the entire design and layout up to them. I told them I wanted it to be about our family. A place where we could scan and share pictures, stories, drawings, music; and more. Granted, the name isn’t the most creative, but the layout looks like they understood what I was looking for, and I like it! We learned what HTML is and how it works; and they learned how to link text and pictures to other sites. They had to do a little research, and were given important tips on how to safely browse the internet. I think this is especially valuable information and I appreciate that it is included in the course. My young web designers liked how Ms. Wheeler showed a graphic of the window they should see if they are following her directions and are on the correct page. This was useful for comparison, reassuring to them that they were understanding the material; and a confidence builder as they worked. They were not as fond of a learn-by-error teaching technique that was used several times. She would direct them a certain way, purposefully wrong, have them acknowledge that it didn’t work; and then redirect them in a way that would successfully accomplish the task. Although it was effective, they felt it was a waste of time. They prefer the do this>go here>see the positive result approach. Overall, though, it wasn’t a deterrent; because Let’s Make a Web Page took away the fear of the unknown, eased concerns of difficulty and failure, and sparked a desire to learn more about computer programming and web design. We haven’t published our web page, yet. As suggested by Ms. Wheeler, I’m going to have my kids design another page or two and have a family vote to determine our favorite. Then, I think we’ll find a free domain and publish it, so we can all keep up more easily with each other’s activities. I’ll post an update here when we’ve settled on our final design. My Crew mates have written more than 50 reviews of these Motherboard Books products. Please, click the banner below and follow the link to read a few of their opinions. Disclaimer* I received the e-book, Let’s Make a Web Page, in exchange for my honest review as a member of the Schoolhouse Review Crew. I receive no other compensation for my reviews on this blog. The opinions expressed are my own. Technology has not changed at our house at the same rate that it has generally, but, we use more of it than many households do, I’m sure. I remember a time when we didn’t own a camera. One year, I wrote every detail I could think of to record our child’s 2nd birthday party. We didn’t have a camera and I didn’t want her to think we hadn’t had a party for her, because there were no pictures; so, I described everything! Eventually, we owned a Polaroid that developed instant pictures and a little 110 camera. We had to send our 110 film off in an envelope to get it developed and then got our pictures in the mail. Initially, 35mm disposable cameras were expensive, yet they cost less than investing in a real one. The first 35mm camera we were able to buy was all manual. You set the flash when you needed it, you advanced the film after a picture and rewound the film by hand and gave it to the developer. It was certainly not an SLR, but I thought it was a wonder! Over the years, we were able to upgrade to an automatic and I have some great pictures from those years. The Christmas after our youngest child was born we were given our first digital camera. You know how, usually, the first child in the family has the most pictures taken of them? Well, that’s not the case here. We have so many pictures of our youngest daughter! Everything new she did was documented with the cool camera that had the itty-bitty screen on the back. Now, a decent digital camera is reasonably priced and there are nearly half-a-dozen, owned by the teens and adults of our family. My younger children think you look at every picture after you take it, they don’t know any different. I used to write out every quiz and test, in duplicate, because I didn’t have a copy machine. When our older children were our young students, they answered workbook questions on separate sheets of paper, so I could reuse the workbooks with their siblings. For the last few years, we’ve had a do-it-all printer/scanner/copier. In years past it wasn’t even a thought to own a personal computer. It was way out of our budget. Now, not only do we own a PC, but we have high-speed internet access. Remember the Walkman that played a cassette tape? One year, several of the children received personal CD players for Christmas. Last year the three youngest were given MP3’s. There are cell phones everywhere! And it wasn’t that many years ago that there were only three television stations and you actually had to leave your house to rent a VHS movie. No HD, no DVD, no Blue-Ray and certainly not as many acronyms. An older daughter has a Kindle and I recently bought a WebOS Touch Pad, for reading and school-on-the-go. Our children know how to use each of these devices and more, usually before we do. The last two school years have seen a dramatic difference in how I teach, because I’ve had access to online curricula. I’m still working on finding a balance, but I don’t shy away from the use of technology, like I once might have done. The fact is, some of my children are a generation apart. Things have changed. I have more options today than ever before, when it comes to their education. By no means are we on the cutting edge of technology, but we are trying to keep a steady pace. Recently, my youngest daughter and I set out on a new adventure. Now, before I take a trip, I like to know something about my destination. I do a little research before I book a flight or a cruise. I read reviews, check out the best eateries and look for places that aren’t tourist traps. I discovered an island that I hadn’t heard of before. So, we went to the logical place to check it out – You Tube. There are dozens of videos about it! This one got us excited about beginning our Ooka Island Adventure! Click graphic to view the Official Trailer. Ooka Island is a virtual online world. A vibrant, energetic world created especially for ages 3 – 7 years, pre-K through 2nd grade. Students style a personal avatar and set off on heroic quests. Along the way, they develop skills essential to prereading, reading and spelling. They learn to understand sounds, associate sounds with letters, blending and making words, all while mountain climbing, cave exploring, cake making and more. This is an innovative program. 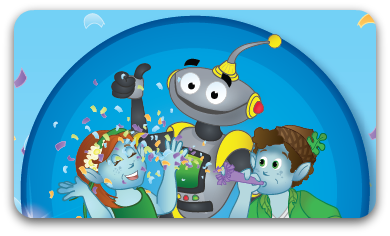 There are 24 levels of purposeful, crazy-fun 3D games, led by a robot named Zobot! The players meet Auntie Kay, Ooka elves that need rescued and the mischievous Figgs. 20 minutes of school work, that they don’t have a clue they’re doing, and they earn 8 minutes of free time. They’re successes are rewarded with the option to play games or buy stuff for their avatar. The ten Ooka Island game areas, are designed to build on each other, getting more difficult with each one. The entire system adapts to each individual child’s progress. It is a complete curriculum, using 85 interactive e-books, on three levels: Emergent, Beginning and Fluency. My daughter is quite fond of the Ooka books, because they seem rather Dr. Seuss-ish and are written for the child. Take your child on an adventure to Ooka Island, there is a Parent’s Page where you can track their progress and play along. 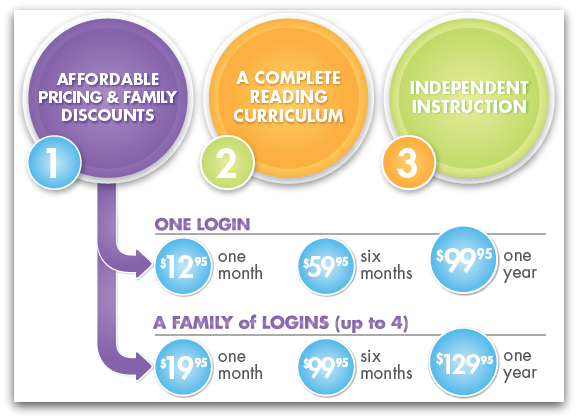 Together, you will motivate and teach him to be a fluent, lifelong reader. There’s no risk with the 14-day Free Trial. Click graphic for full pricing overview. Use promo code: LAUNCHSPECIAL30 and save 30% on a monthly subscription. To read other Ooka Island Adventures reviews, click the TOS Homeschool Review Crew graphic below. Stay up-to-date with everything on the island by following Ooka on facebook. Browse the website: http://www.ookaisland.com and read Village Voices, the Ooka blog. Okay, I’ll admit it – homeschooling my children can be absolutely exhausting. There can be so much prep work: per grade level, per subject, per student, besides teaching, grading and testing. Don’t get me wrong – I love schooling my children at home, I’m just acknowledging the consumption of time and energy it often devours. Which is why I have an appreciation for products and publications that help me cut a few corners and save a bunch of time. Time that I much rather use on field trips and picnics, beach volleyball (P.E.) and the zoo. Science Weekly is one such publication. Published 15 times per year, twice per month (following an average school year) – September, October, November, January, February, March and April, and once in December. Science Weekly is an Earth Science, Life Science, Physical Science, or Technology supplement to your science curriculum. It encompasses and enhances your child’s skills in science, math, reading and writing. Each of my children enjoyed having their own publication, tailored to their level. There is more text, more in-depth activities and labs, etc. as each level increases in difficulty. The subject we received was The Flu. I gave the Teaching Notes (TN), which cover every level, to one of my high-schoolers. She was able to read the notes, gather common, household supplies for the lab sections, hand-out the individual magazines and proceed to teach this science lesson to 5 students. She was able to easily do this because the information was already researched, correlated, and plainly written out in the Teaching Notes. You could initially know nothing about a given topic and thoroughly teach it. This graphic is the cover of the Science Weekly publication, Coral Reefs. If you click on it, there is a FREE download of a sample issue of every level of Coral Reefs. Check it out for yourself. You do the math… I think it’s a good value and we’re already looking forward to studying the other subjects. and printable coloring books. The interactive program is a great resource. The layout is very similar to the printed publications, without the pencil and paperwork. Many of my Crew Mates received different topics than I did. You’ll want to read their reviews at the TOS Homeschool Crew Blog. Thank you for your continued encouragement. I truly appreciate your comments. As many of you know, we have homeschooled our children for years. Teaching higher math has always been a challenge. Usually, it’s the only subject I want to ship them out for or at least hire someone to come in and tutor them. If I thoroughly understand something, I tend to be able to break it down and teach it. Notice that “thoroughly understand” and “higher math” are not in the same sentence. The cavalry has arrived though and this challenge can now be conquered at www.virtualnerd.com. Virtual Nerd is an interactive video tutorial with over a thousand videos. Presently covering Pre-Algebra, Algebra 1, Algebra 2 and Intro Physics. Searching by keyword, topic or textbook, questions are asked and answered. Students learn at their own pace, gaining a clear understanding of science and math concepts as they study. A private tutor, available on your schedule, for a fraction of the cost. Will this be your new conquering hero? Let me know. What other challenges do you face and who do you call when you need the cavalry?